With the new calendar year, our indoor volleyball season opened with a tournament this past weekend. 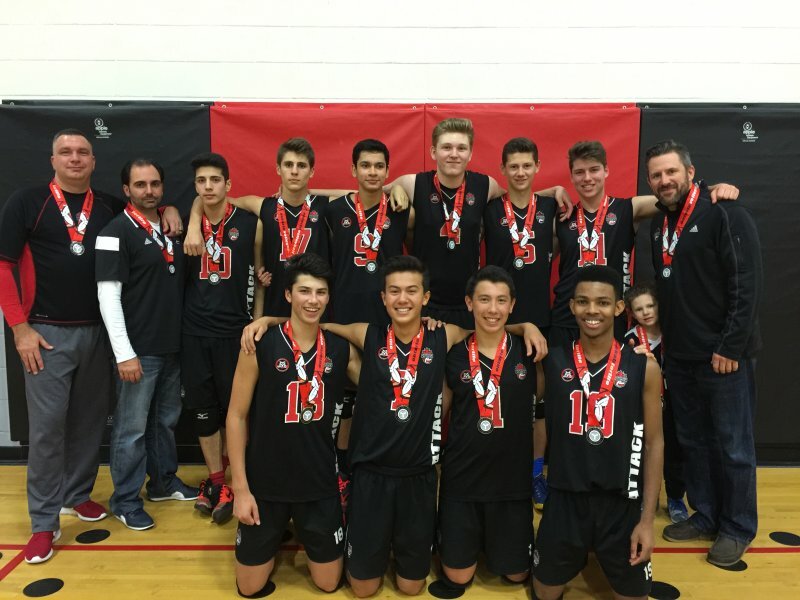 Our DA 16U Boys Black team competed locally at Maxwell Heights Secondary School (Oshawa). With a two-week hiatus (from the Holiday Break), our two injured players had the time to heal and to get healthy. In the morning, our first opponent of the day was the Maverick Longhorns. We had already beaten this team twice already this season. Make it 3 times this season, as we quickly dispatched the Ottawa team in two straight sets (25-17, 25-17). Our second Pool Play match pitted us against Storm Inferno. At the beginning of the season, we had unexpectedly lost to this team. So this was a chance for redemption. Our boys came out blazing out of the gate and absolutely dominated the first set, 25-10. The second set started in similar fashion with a commanding 6-1 lead. But then the tide began to shift. Uncharacteristically, the boys started to make a series of mental errors: a service error, hitting error, passing error, setting error and a setter net violation. Just like that, the lead evaporated and the score was tied 6-6. The rest of the set continued with more unforced errors, and soon we found ourselves on the losing end of the second set: 20-25. The third and deciding set started off well again with an early 6-3 lead. But then our passing completely broke down. We gave up 7 of the next 10 rally points, largely on passing errors. Without a decent serve reception, we couldn’t run our offense. Giving free balls to your opponent over and over again translated into a losing recipe. We were narrowly defeated 13-15. No redemption today! Fortunately, we won the 3-team tiebreaker in our Pool. So we advanced to face the Niagara Rapids in the Quarter-Finals. Unfortunately, our passing woes and mental errors continued. In the first set, we committed 7 passing errors and 4 service errors. Awarding 11 points to your opponent in a single set is far too generous. We dropped the first set 19-25. As true champions, however, the boys managed to bounce back from this shocking defeat. We finally woke up and started to play with some tempo, confidence and energy. We rallied back to win the next two sets in decisive manner: 25-18, 15-9. Once again, our DA Black team was on the verge of elimination. We had to win to stay in contention. With our backs against the wall, the boys responded with true resilience. The key difference was serving. That is, we served more aggressively to score some aces, or at the very least, forced the opposing setter off the net to limit their attack options. Despite not playing consistently well throughout the day, the boys managed to find a way to overcome adversity in critical situations. We bounced back to win the next two sets: 25-15, 15-8. The Finals featured a match with our arch-rivals, Pakmen Gold. At the 16U Boys division, both Durham Attack and Pakmen can be arguably considered the top 2 teams in the province, if not the whole country. Surely, this would be an exciting match between the two heavyweights in the division. In the first set, side-outs were traded in the early going. Our DA boys then seized control by scoring 8-points in a row! Contributions were made from all dimensions: middle blocking, outside hitting, serving aces, sprawling defense digs, etc. We steam-rolled Pakmen to a quick first set win, 25-16. But, as we all know, momentum can be fickle. The second set started with some big kills shots by both teams. Scoring was swapped back-and-forth. Our passing struggles then resurfaced. At one point in the game, we shanked 4 consecutive passes. Yikes! Allowing 4 aces in a row can really demoralize a team. This 4-pt deficit proved to be insurmountable, as we lost the second set, 19-25. So a third and deciding set would determine the Gold medal. This would be the fourth consecutive 3-set match our boys would endure that day. Would we be able to mount another comeback? Unfortunately not this time. We fell behind 0-4 right out of the gate. Once again, our serve receive was suspect. We lost 9-15 to take home the Silver medal. Overall, it was a good day for the boys. In the Premier division, our DA boys proved themselves capable of competing against the very best teams in the province. One area that definitely needs improvement is passing. Service reception will always be critical to a team’s success. With a solid passing game, our DA Black team can be virtually unstoppable. We have hitters that can blast the ball from all sides of the court. But the offense always starts with a good pass. As we all know, there will always be room for improvement. For next weekend, we travel to Chicago to compete at the 2016 USA Boys Winter Volleyball Championships. We will have the opportunity to test our competitiveness against the best in the U.S. Good luck!